VoltStorage is what you might call a “typical” Munich startup. The team is made up of former TUM (Technical University of Munich) students, whose aim is to build a power storage unit that is the safest and most economical for private homes with solar power systems. In other words, they want to make solar energy usable 24/7 and also affordable. Michael Peither, the co-founder of VoltStorage, became aware of a problem during his studies: power storage units for solar power systems are expensive – extremely expensive. He wanted to make them more cost-effective, and deepened his research by taking a semester off to conduct experiments in his parents’ basement. And so the first prototype was born. The core VoltStorage team began to take shape around him based on their shared interests. Michael is an electrical and industrial engineer, Jakob Bitner is an economist and Felix Kiefl is a mechanical and electrical engineer. It goes without saying that the trio of Munich founders has a good combination of know-how to offer. Safer, less expensive and more convenient! So what makes this young startup and their technology different from their competitors? Vanadium redox batteries have only been used for large-scale applications until now. They are usually roughly the size of a shipping container, and have always been assembled by hand. 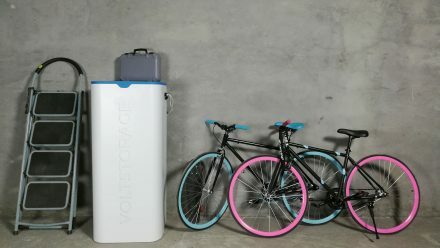 VoltStorage has been able to cut the battery down to the size of a small refrigerator. According to the founders, they have also been able to significantly reduce costs by using new and more cost-effective materials as well as a standardized manufacturing process. At the moment, the startup from the Bavarian capital is occupied with establishing a solid team locally and with manufacturing pre-production models of their battery. From September 2016 to January 2017, development continued in China. The founders were also able to secure important funding (in German only) at the start of the year. Since Michael and his co-founders studied at TUM, which closely links them not only to the city but also to the incubators from the two large Munich universities, no other city even came into question when choosing their location.